July 18, 1934: “The Gumm Sisters” engagement at the Belmont Theater, Chicago. This was a one-night engagement as a last minute replacement for another act. 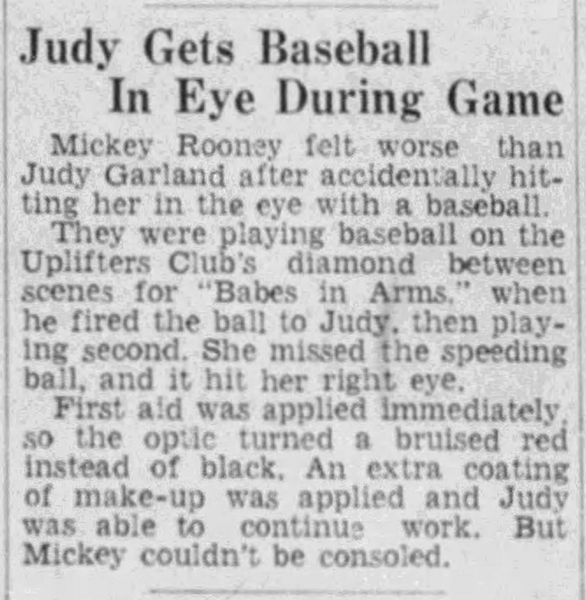 July 18, 1939: According to this news blurb, Judy allegedly received what was almost a black eye, from co-star Mickey Rooney during a baseball game between takes of filming on Babes in Arms. This might be true as the kids were required by California law to have a certain amount of schooling and exercise each day. 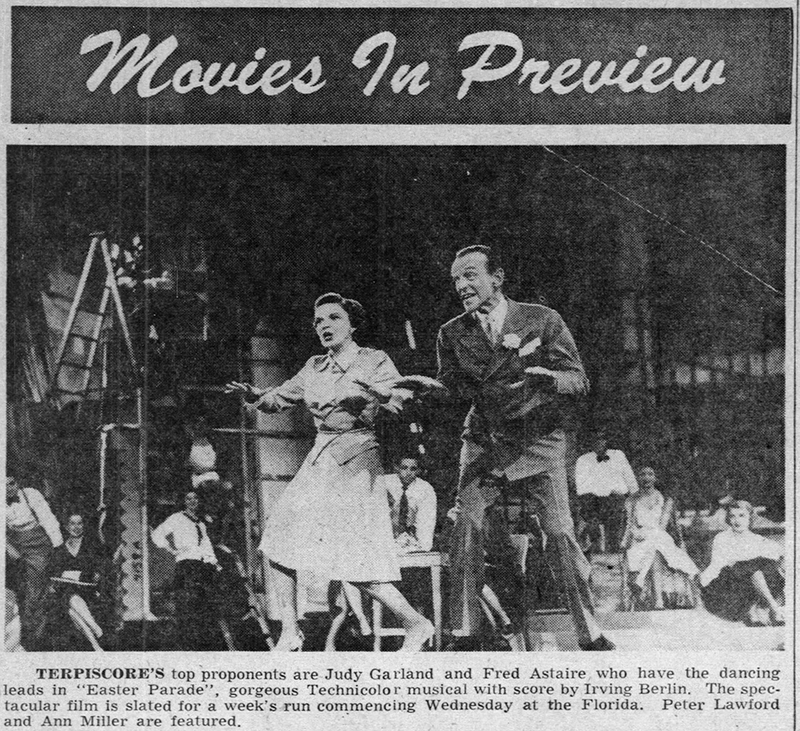 On this day, Judy completed filming on Babes in Arms, with the final work being scenes shot on the “Exterior Stage Door” (on Lot 2) and “Interior Madox Theatre” (the “Finale” sequence on Stage 27). 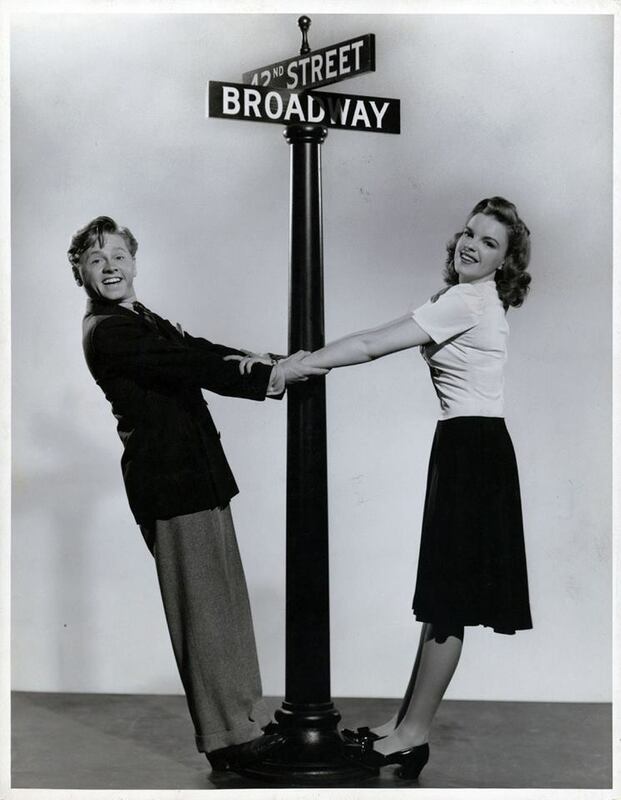 Judy was on the set at 9 a.m.; lunch: 12:30 – 1:30 p.m.; dismissed: 6 p.m.
July 18, 1941: Judy and Mickey Rooney pre-recorded “How About You?” for Babes On Broadway. Time called: 6:30 p.m.; dismissed: 9:15 p.m. The song became a standard, heard in quite a few movies over the years. It was nominated for the Oscar for “Best Original Song” but lost to “White Christmas” from Holiday Inn. 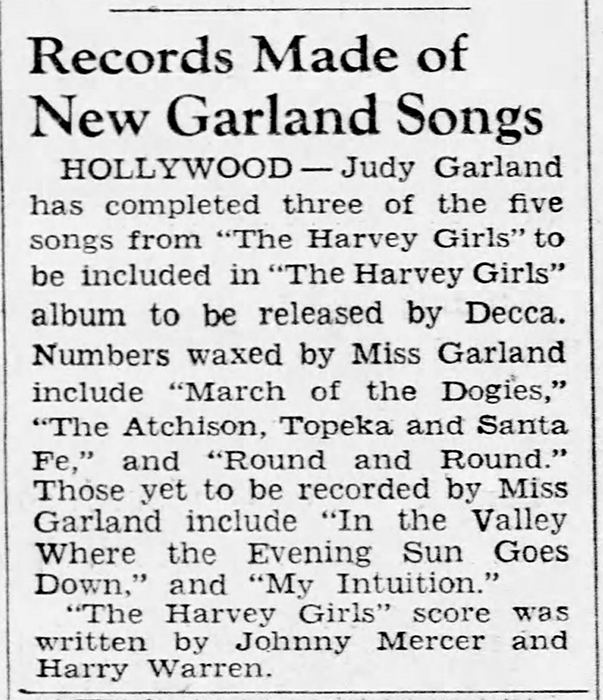 Incidentally, that was the first of two times that a Bing Crosby song would beat a Garland song at the Oscars. 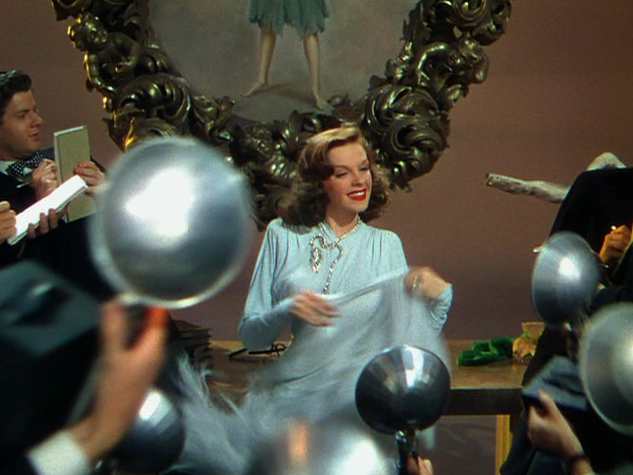 The second time was in 1945 when “Swinging on a Star” from Crosby’s 1944 film Going My Way beat “The Trolley Song” from that same year’s Meet Me In St. Louis. 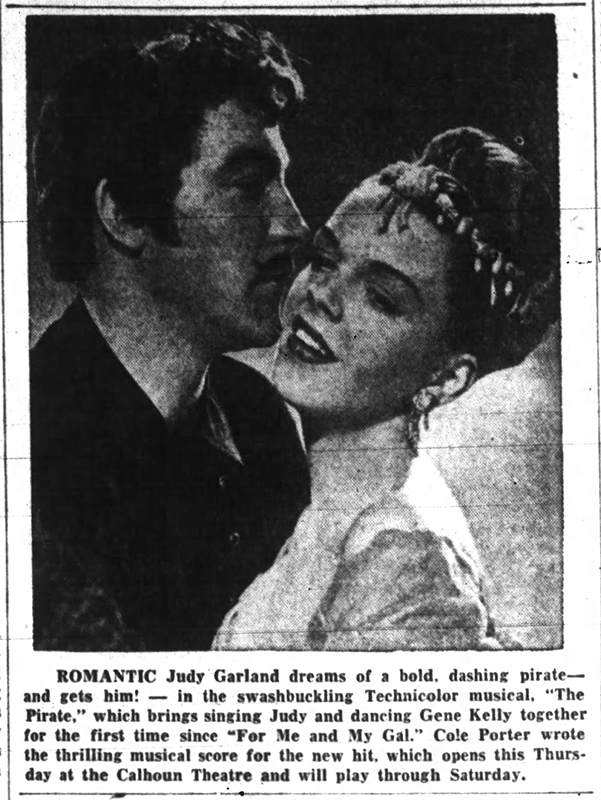 “Swinging on a Star” became as identified with Crosby as “The Trolley Song” was to Judy. Photo: Publicity photo by MGM studio photographer Clarence Bull. 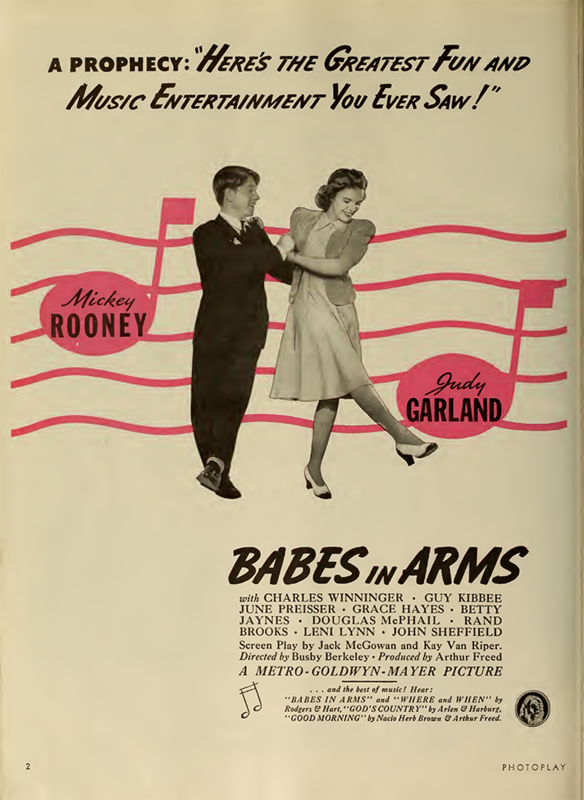 The text on the back of the photo, composed by MGM’s publicity department, reads BABES ON BROADWAY.….That’s what Mickey Rooney and Judy Garland turn up as when their dreams come true in the Metro-Goldwyn-Mayer picture by the same name, “Babes on Broadway.” Mickey and Judy are co-starred in the youthful musical, featuring Fay Bainter Virginia Weidler, Ray McDonald and Richard Quine. Busby Berkeley is the director, Arthur Freed the producer. July 18, 1944: More rehearsals on “The Interview” number for Ziegfeld Follies at MGM’s Rehearsal Hall A. Time called: 9 a.m.; dismissed: 4 p.m. This was the last day of rehearsals on the number. Filming started the next day. 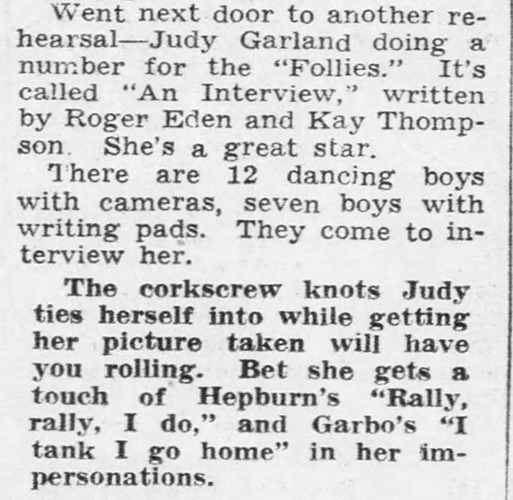 Hedda Hopper reported on the rehearsals having allegedly just made a tour around MGM. 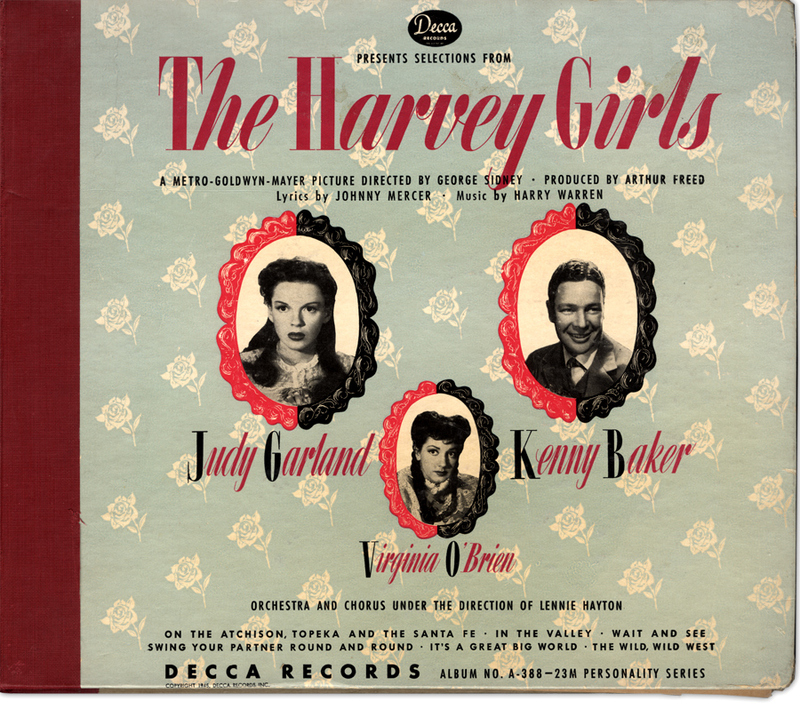 Check out The Judy Garland Online Discography’s The Harvey Girls on Decca Records pages for details about the various releases of the album. 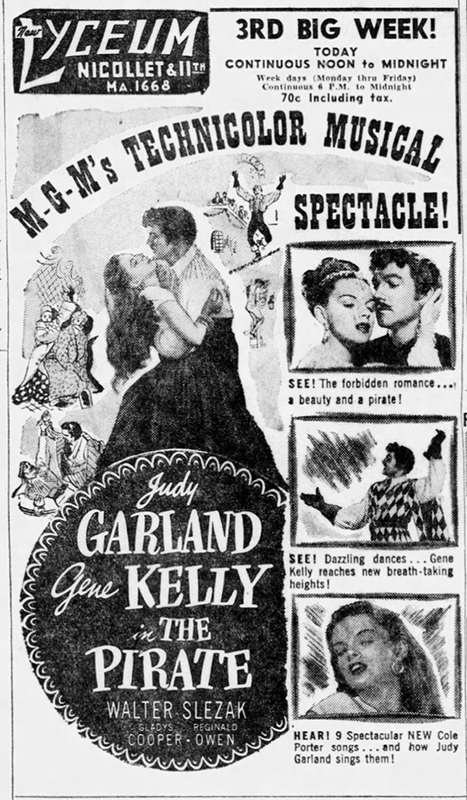 July 18, 1948: Judy was officially removed by MGM from the production of The Barkleys of Broadway and placed on suspension. Ginger Rogers was brought in to replace her. Judy rested for the next two months. She moved out of the home she and husband Vincente Minnelli shared (at 121 South Beverly Drive, Los Angeles) into a house at 10,000 Sunset Boulevard. The move was to gain additional rest per her doctor’s advisement. Hedda Hopper broke the news on this same day. She obviously had the scoop from the studio early! Check out The Judy Room’s Filmography Page on The Barkleys of Broadway here. It’s a shame that Judy wasn’t able to enjoy the success and accolades she was receiving at this time. 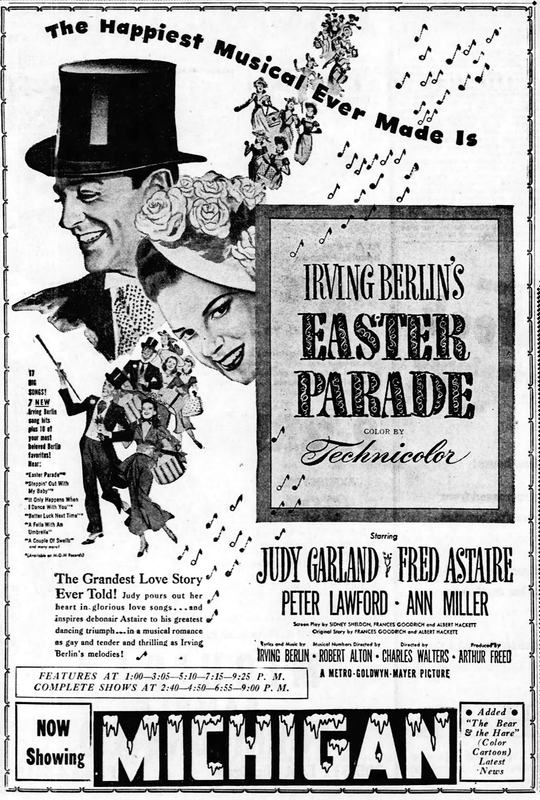 Both The Pirate and Easter Parade were in circulation and audiences everywhere had the chance to see, and enjoy, the full range of Judy’s talents. 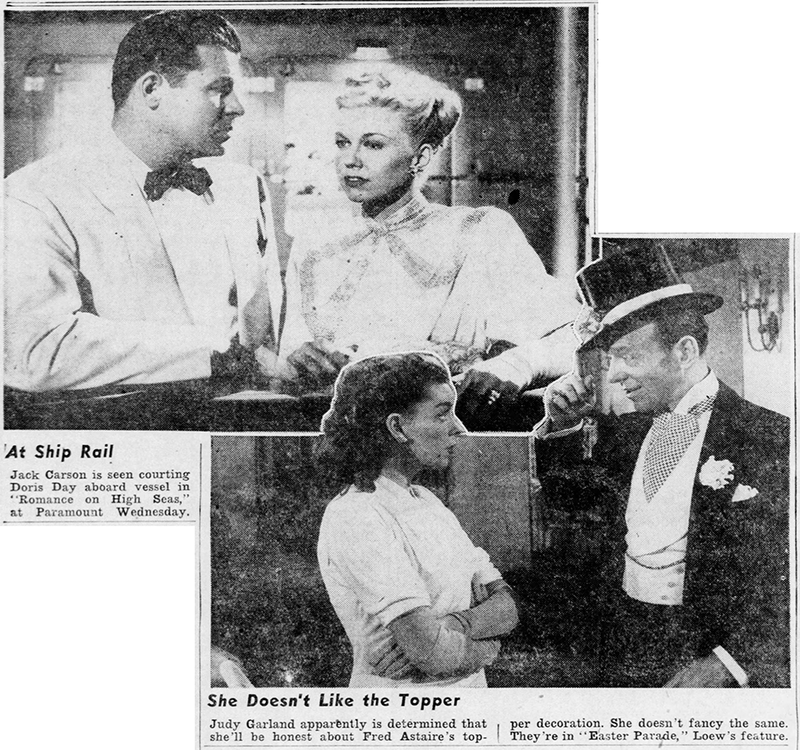 Note that in one of the clippings above, Easter Parade is shown with Doris Day’s film debut in Romance on the High Seas. That film, made by Warner Bros., was originally conceived for Judy, but naturally, MGM wasn’t about the loan her out to a rival studio. Day eventually got the job and embarked on her own legendary career as a film star. 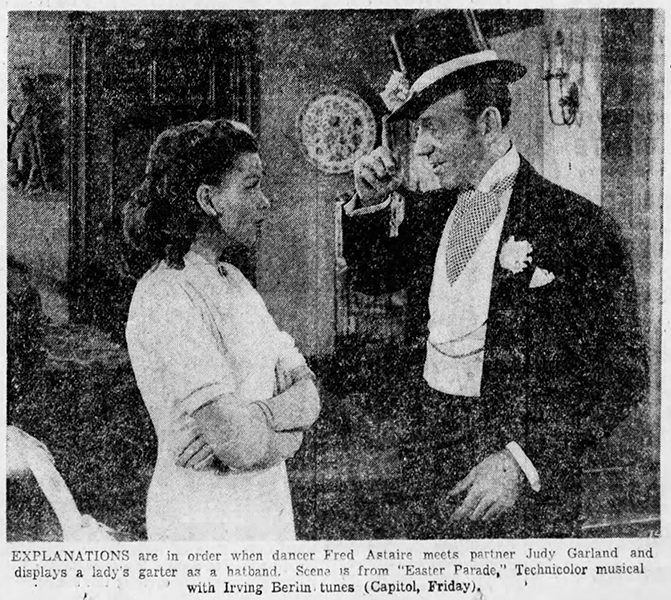 July 18, 1950: Hedda Hopper reported in her column that after Judy completed her upcoming engagement at the London Palladium, she would open on Broadway a musical adaptation of the Helen Hayes play titled “The Good Fairy” with songs written by Hugh Martin. 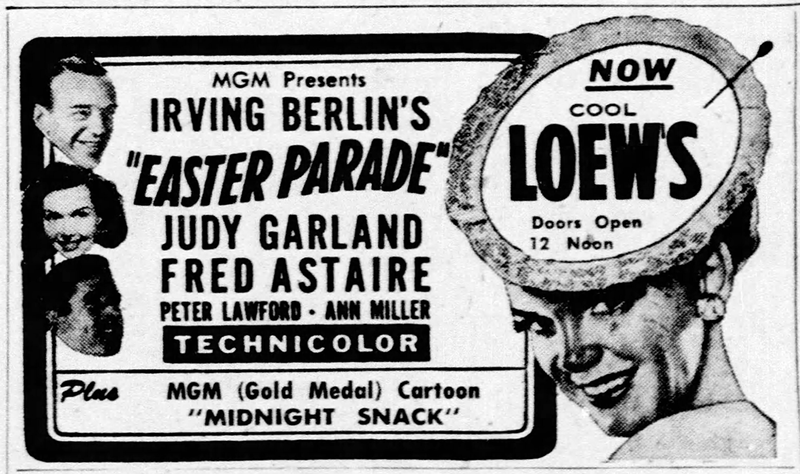 According to Hopper, Martin had written the score and Judy said it was “delightful.” Judy did end up opening in New York, but not in “The Good Fairy.” After her astounding success at the Palladium, she re-opened The Palace Theater in New York successfully bringing Vaudeville back to the Palace in one of the greatest comebacks in show business history. “The Good Fairy” made it to Broadway as a musical with songs by Hugh Martin, retitled “Make a Wish” and starring Nanette Fabray with choreography by Gower Champion. 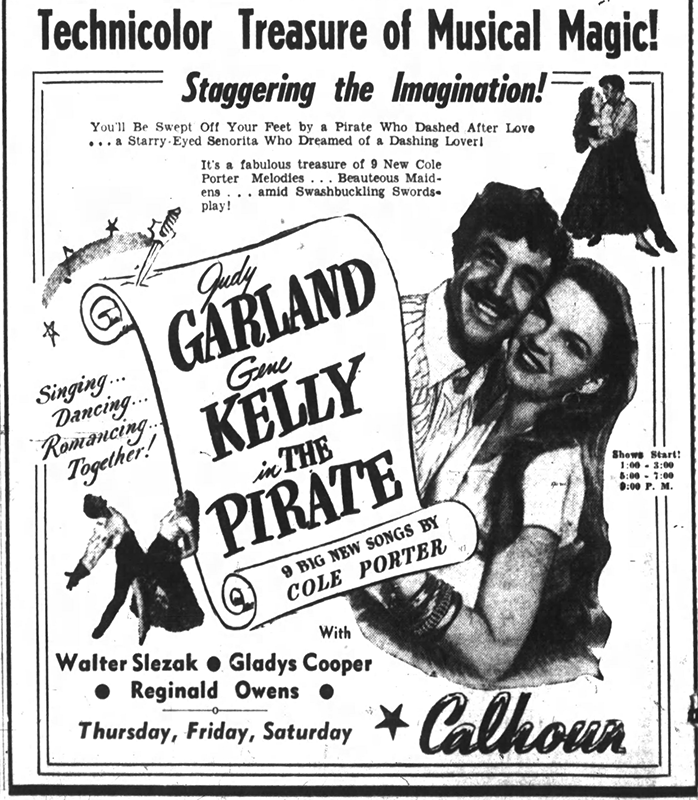 It opened on April 18, 1951, and ran through July 14, 1951. 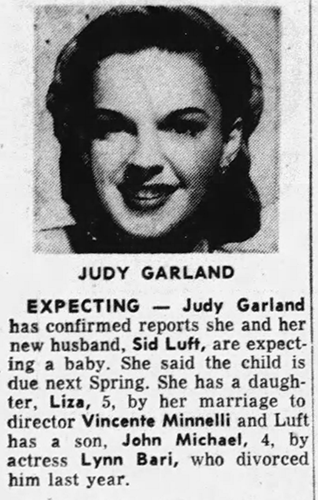 July 18, 1952: Judy is expecting. 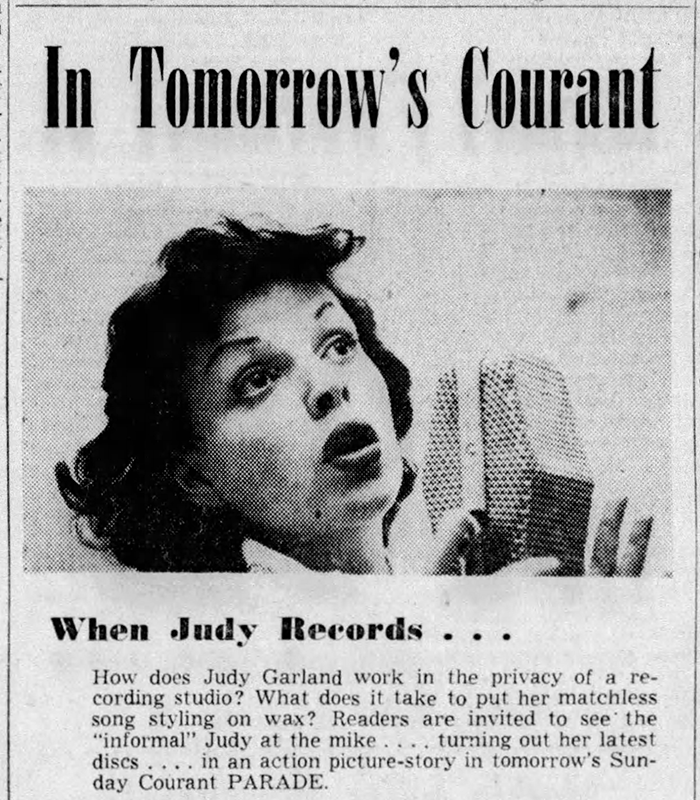 July 18, 1953: Tomorrow, Judy returns to the recording studio. 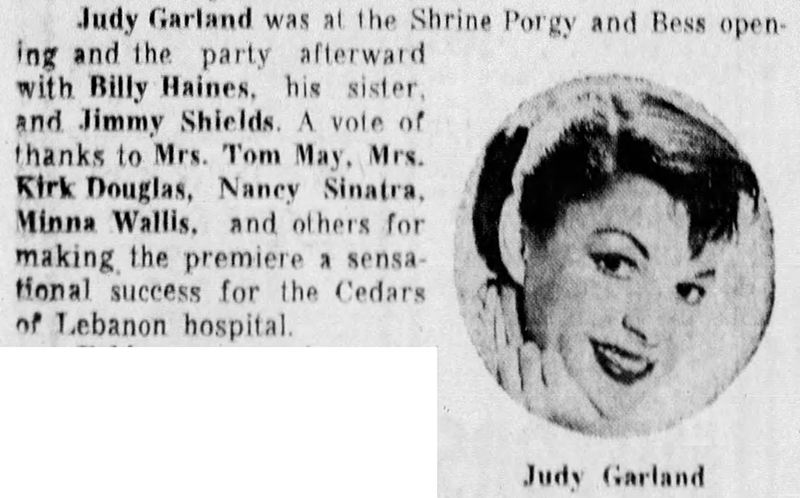 July 18, 1959: According to Hedda Hopper, Judy saw a performance of “Porgy and Bess” and the Shrine in Los Angeles and then went to a party given by noted designer William Haines. It’s interesting that Hopper lists Billy Shields. Shields was Haines’ partner in both business and life. They lived an openly gay life together. Haines has been a huge MGM silent star and made a successful transition to talkies. 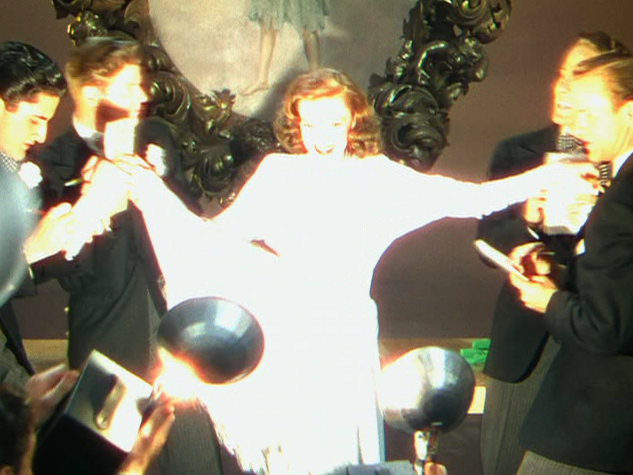 However, when the Production Code was being enforced, MGM chief told Haines he had to give up his life with Shields and enter into a “lavender” marriage. He refused, choosing to say with his Shields. Before you knew it, Haines was replaced by Robert Montgomery in all the films he would have starred in and was let go. 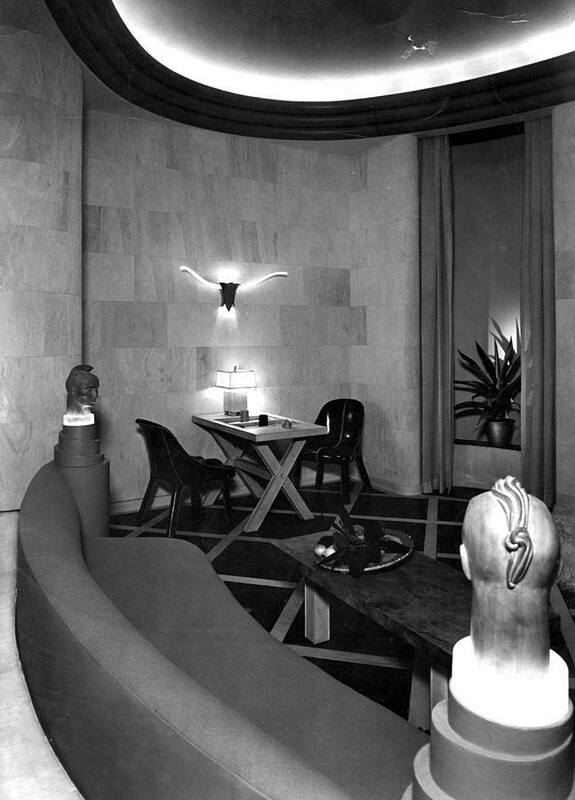 Luckily, he had his design business to fall back on (he’s the one who designed Joan Crawford’s all white living room). He ended up becoming one of the biggest designers in Los Angeles. Even Nancy Reagan wanted him to redecorate the Governor’s mansion when Ronald became governor of California. But, he was too expensive. He and his partner, Jimmie Shields, stayed together until Haines’ death in the early 70s. Shields didn’t last much longer, heartbroken over the loss of Haines. They had been together for over three decades. Haines had an even bigger connection to Judy than this one party. 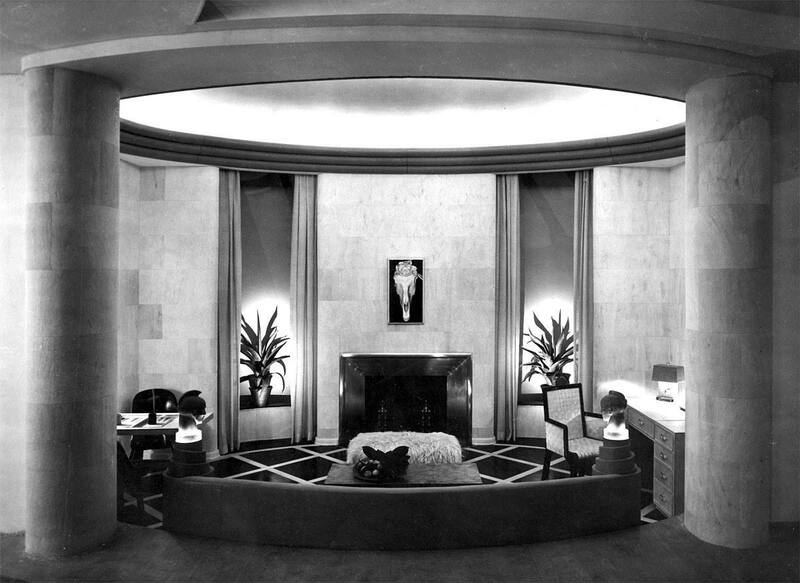 Jack Warner wanted Haines to design the sets for A Star Is Born. 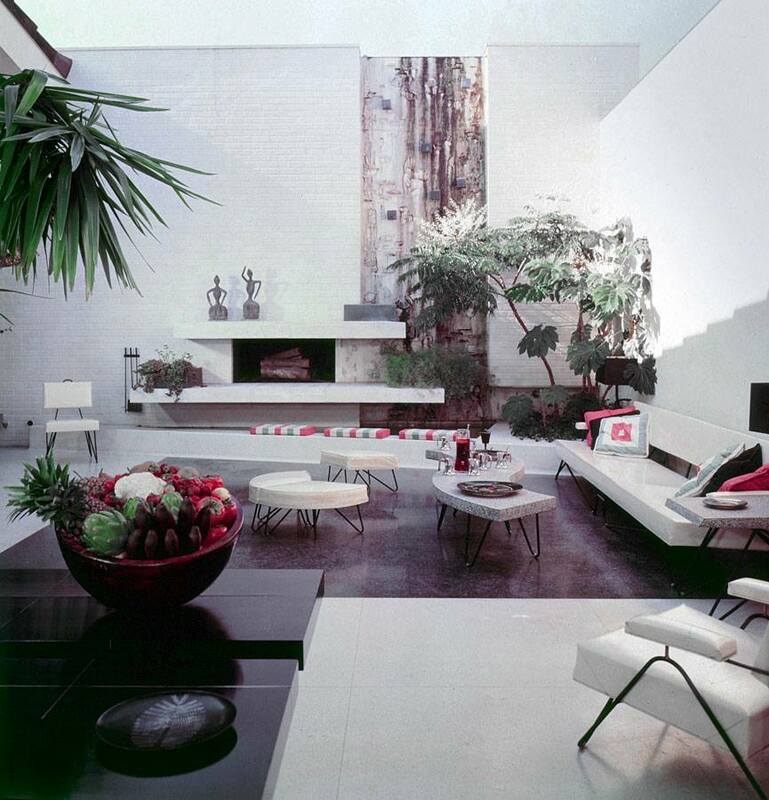 He refused, so they modeled the Norman Maine/Vicki Lester home after Haines’ designs anyway, including partly copying Warner’s screening room from his own home, which was designed by Haines. Photos: The Hopper clipping; Haines’ living room for the (Frances Lasker) Brody House (1951); Warner’s screening room (photo date unknown); the “Desert Living Room” from the 1940 World’s Fair on Treasure Island in San Francisco Bay; a couple of shots from A Star Is Born. July 18, 1965: Judy was interviewed by phone by Peter Lind Hayes. This was the day after her successful concert at The Forest Hills Stadium in Forest Hills, New York the previous day. 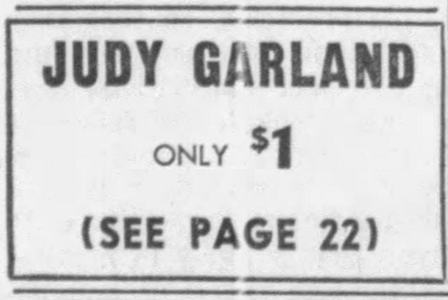 July 18, 1968: Imagine paying only one dollar to see Judy Garland in concert. Fans in the Philadelphia area had that chance in 1968. Judy arriving in town on the 16th and gave a press conference where she was staying, the Warwick Hotel. Rose DeWolf of the Philadelphia Enquirer reported on the conference. 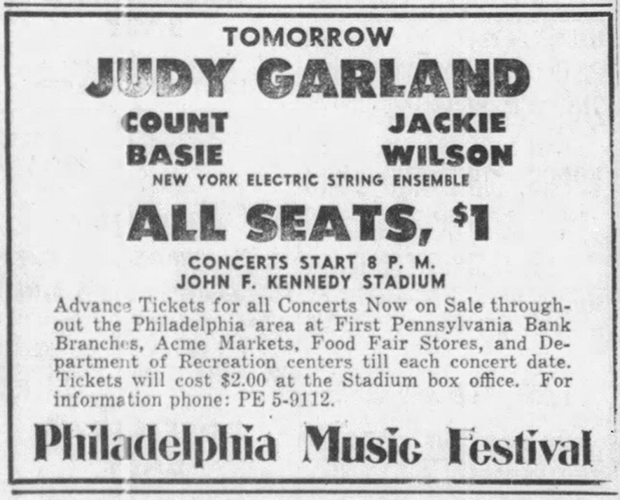 Judy’s concert took place on July 20th and was her last concert in the United States. Another great post (love those “screening room” pics. Wow.) Funny how time dims Oscar wins. While “Swinging on a Star” is a lovely song, I don’t believe it has endured as well as “The Trolley Song.” Also, it is shameful that “Meet Me in St. Louis” wasn’t nominated for Best Picture, when it was such a groundbreaking film. Still cannot believe that in a year that gave us “Double Indemnity”, “Laura”, “Lifeboat”, and “St. Louis”, “Going My Way” won Best Picture. It’s actually embarrassing in retrospect. But cornball Bing couldn’t do wrong (even though he was a miserable drunk), AND he was playing a priest! I’ve always been relieved that he and Judy didn’t do a picture, as I don’t believe they would’ve had much chemistry, despite how well they sang together. I would’ve preferred a 1940’s teaming of Garland with Sinatra, as both represent – in my opinion – the greatest singers of their gender. How wonderful THAT teaming would’ve been!